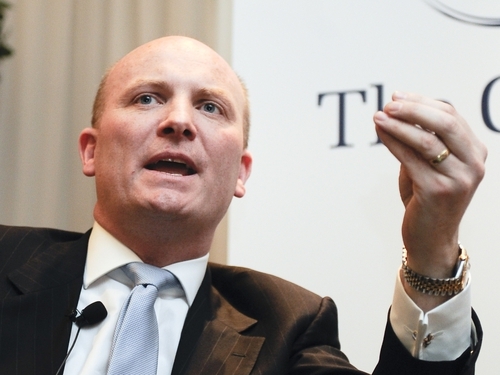 Libertas founder Declan Ganley has said next month's referendum on the Lisbon Treaty is 'profoundly undemocratic'. In an interview with the Wall Street Journal, Mr Ganley said the electorate was being asked to vote again on exactly the same treaty. He dismissed suggestions that a No vote would hurt the economy and said the only people voters risked annoying were 'a bunch of unelected bureaucrats'. Last June, Mr Ganley failed to win a seat in the European Parliament in the Ireland North West constituency. At the time he said he would not be involved in the second referendum campaign and that his political career was over. Mr Ganley has not commented on a possible return to the Irish political scene. Elsewhere, the Minister for Finance Brian Lenihan claimed that a No vote would shatter international confidence in Ireland's ability to work through the current economic crisis. Speaking at a Fianna Fáil news conference in Dublin, Mr Lenihan claimed this would lead to a shortage of funding for our banks, increased costs of borrowing and less money for State services. The Minister denied he was pursuing the politics of fear and said the European Union is of great benefit to Ireland. He said it was a matter of goodwill and Ireland needs plenty of goodwill. Enda Kenny has launched a national campaign in support of the Lisbon Treaty. The Fine Gael leader again called on his party's supporters to put aside their prejudices and anger at the Government and to vote in favour of the Treaty. Employers' group IBEC claimed that a No vote would increase uncertainty about Ireland in the minds of foreign investors. The head of the Technical, Electrical and Engineering union has called for a No vote in the Lisbon Treaty referendum. He said the treaty must be changed to guarantee Irish workers the right to collective bargaining. The Head of ICTU claimed the treaty does enhance workers rights, and would help to introduce collective bargaining rights into Irish law. The 45,000 strong TEEU leader, who is opposed to Lisbon, has been debating with David Begg, the general secretary of the Irish Congress of Trade Unions, who supports Lisbon. Earlier the Minister for finance said a No vote would shatter international confidence in Ireland and the irish economy. While Enda Kenny launched Fine Gael's nationwide canvassing by calling on party supporters to put aside their dislike of Fianna Fail and support the treaty. Sinn Féin has said it is stepping up its campaign for a No Vote on 2 October. Party President Gerry Adams said today: 'Sinn Féin is stepping up its campaign against the Lisbon Treaty, which continues to represent a bad deal for Ireland. Another anti-Lisbon party, Republican group éirígí, launched a poster campaign.